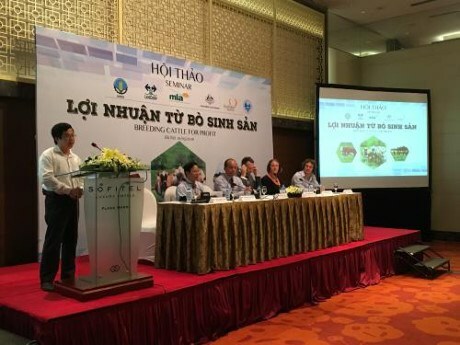 Hanoi (VNA) - A ​seminar entitled "Breeding cattle for profit" took place in Hanoi on May 10 to discuss solutions for the sustainable development of Vietnam’s cattle industry. The event was organised by the Ministry of Agriculture and Rural Development, the Australian Embassy to Vietnam and the Meat and Livestock Australia (MLA). According to Michael Patching from the MLA, the seminar is part of a cooperation programme between Australian and Vietnamese governments to provide support for beef cattle industry in the country. Over the past three years, Australia has not only exported live cattle to Vietnam but also invested in developing breeding facilities and slaughter houses as well as personnel training in the country, he said. Australia also looks to involve more in local beef cattle value chain, particularly cattle breeding and production safety, Patching added. Director of the Vietnam Ruminant Breeding Centre Le Ba Que recommended ways to develop the country’s herd of milk and beef cattle, saying that policies should be designed to offer more support for cattle farms and breeding cooperative programmes and to boost advanced technology applied in the industry. The enhanced connection between the government, scientists, agribusiness and farmers is needed while more market research and forecast are required to get the production on the right track, he noted. Deputy Minister of Agriculture and Rural Development Vu Van Tam cited the fact that domestic beef production failed to catch up with local demand which has been on the rise over the last three years. It has led to the surge in beef imports, notably from Australia. The number of beef imported from Australia spurred from 3,500 in 2010 to 181,000 in 2014, reflecting a 52-fold growth in just four years. Beef now accounts for about 7 percent of meat consumption in the country and is predicted to reach 12 percent by 2020, the deputy minister said.